The Nigeria U-20 national football team will be participating in the Orange African Youth Championship 2011. The tournament will be played in Libya but are currently postponed due to security concerns in the North African country. Gomo Onduku, the highly talented attacker of Sharks FC from Port Harcourt, will most likely be one of the key players for the Nigerian team and in this post I will present this exciting prospect. Gomo Onduku started his professional career at Bayelsa United FC, currently playing at the second level of Nigerian football as a result of their relegation at the end of the 2009-2010 season. Onduku was part of the Bayelsa United FC squad for the 2008-2009 season and it turned out to be a wonderful season for the club, based in Yenagoa in the southern parts of Nigeria. Bayelsa United FC ended the season as champions and Gomo Onduku scored one goal during the campaign. It is difficult to find information about Onduku’s performances during the season but I have an impression that he showed a lot of promise, but primarily was a fringe player. Onduku decided to join Sharks FC for the 2009-2010 season, which proved to be a smart move by the gifted player. Onduku was an immediate success and established himself as a first team regular. Onduku scored three league goals during the season. Towards the end of the season, in May 2010, Onduku was named in the squad of the Nigeria U-20 national football team. 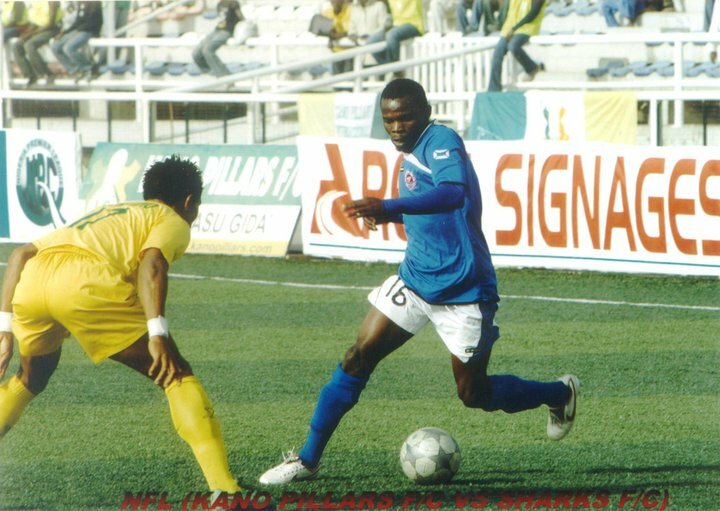 Sharks FC played in the so-called 2010 WAFU Club Championship, a tournament for West African club sides. Sharks FC knocked out USS Kraké(Benin), ASPAC FC(Benin), Stella Club(Ivory Coast), Horoya AC(Guinea) and eventually won the final against Casa Sport(Senegal). It is hard to find information about the matches but several sources point out that Onduku showed his brilliancy during the tournament. Onduku has been one of the stars of the Sharks FC team during the current season, the 2010-2011 Nigeria Premier League, and SuperSport describes him as one of the “leading lights” of the team. He has so far scored two league goals during the season. Onduku is a regular player but has lost several matches through his Nigeria U-20 commitments. Onduku is described as an “attacking winger” or a “forward”. My earliest records of the player classify him as a right-winger but he has also played as a left-winger for Sharks FC and the Nigeria U-20 national football team. It is therefore fair to say that Onduku is a versatile attacker. He is known for his dazzling runs down the flanks, his skills and he is also dangerous from set-pieces. Onduku was part of the Nigeria U-20 national football team who played several friendly matches in February / March 2011. Onduku scored goals in friendly matches against PFC Olexandra, a second division side from Ukraine, and FK Atirau, a top level side from Kazakhstan. Age is always a concern in Nigerian football and little is known about Onduku’s career before the 2008-2009 season. However, it is a fact that Onduku was part of the Bayelsa United FC squad for the 2005 Norway Cup, one of the largest youth football tournaments in the world. Bayelsa United FC participated in the so-called “Class A”, which was for boys “born after 01.01.1986 and later”, basically boys who were 17, 18 or 19 years old at the time of the tournament (August 2005). Onduku was interviewed by a Norwegian newspaper during the tournament and stated that his hero as a football player was John Obi Mikel, currently of Chelsea FC(England). A player who is part of the current Nigeria U-20 national football team will most likely be born in 1991 or 1992. It seems questionable that Bayelsa United FC would include a 13 or 14 year old boy in their “Class A” team for the 2005 Norway Cup, but it is certainly not impossible. I have personally always thought Onduku was born in 1988 based on his Norway Cup appearance but this is just a theory and could very well be wrong. Gomo Onduku’s name is sometimes spelled “Gomo Unduku”. His full name is “Richard Gomo Onduku” and he uses the name “Richard Onduku” at his Facebook-profile. He is also referred to as “Pascal Gomo” or “Pascal Gomo Onduku”. The picture is taken from Facebook and shows Onduku in action against Kano Pillars FC on 15.01.2011. 2007,8 n 9, then 2009 he move to sharks f.c of port-harcour wr he was fantastic winning player of the week and player of the month scoring 9 league goals and 5 FA cup goals.his the best winger in NPL last season. thanks for your comment. I am sorry that you feel this way. I had to find my four year old e-mail correspondence regarding Eziyodawe and I can confirm the following: in 2008, I received an e-mail from my local club SK Brann regarding Eziyodawe. Attached to the e-mail was a CV of the player. According to the CV, Eziyodawe had scored 9 league goals in 2007-2008 for Enyimba and 16 goals for Bendel Insurance FC in 2006-2007. SK Brann wondered what I thought of the player and my comment was that Eziyidawe had not scored this many goals, which are simple facts, and I personally doubted his quality. I never wrote anything about age-cheating. Personally, I think he is an honest player but simply not good enough for Norwegian football. Based on his performances for Lillestrøm, I think most people will say I was right – although he did struggle with injury to be fair. My friend bayelsa utd have neva travel to Norway 2005,Bayelsa utd playd pro league 2005 n it was dat year they gain promotion fron pro league 2 premiership and he was not in d team..he join Bayelsa utd 2008 so what are you talking about…you r very very wrong…..you just want to dstroy the pour boy carrier for noting..
i think you are making an error here because onduku was not part of the team. why do we NIGERIAN like blackmailing?why blackmailing onduku for nothing?what do you gain in doing this?he never played NORWAY cup with BAYELSA utd,and BAYELSA Utd had never traveled to NORWAY before.ONDUKU sign for BAYELSA Utd 2008 season and that is his FIRST season in NPL. You are VERY correct. My mistake. thank you so much for kind words about my blog! When it comes to Onduku you are correct that Bayelsa United FC won the Norway Cup Class A in 2004. But I don’t think Onduku was part of that team. Bayelsa United FC participated in the Norway Cup Class A in 2005 as well and lost the final match to a Norwegian team called Vindbjart FK. It was in this match I know that Onduku played a big part. I have not written that Bayelsa United FC won the Norway Cup in 2005. I think that you have an error here. According to the official website, Bayelsa UTD are the official winners of the Class A of 2004 and not 2005 as you wrote. Probably a typo but I thought I should tell you anyway. http://www.norwaycup.no/index.php?c=115&kat=Winners+1972+-+2010 but you know the link already. Besides the (possible) correction I would like to add that you do some SERIOUS blogging. Probably one of the best stuff I have read so far. I say this as a blogger myself.